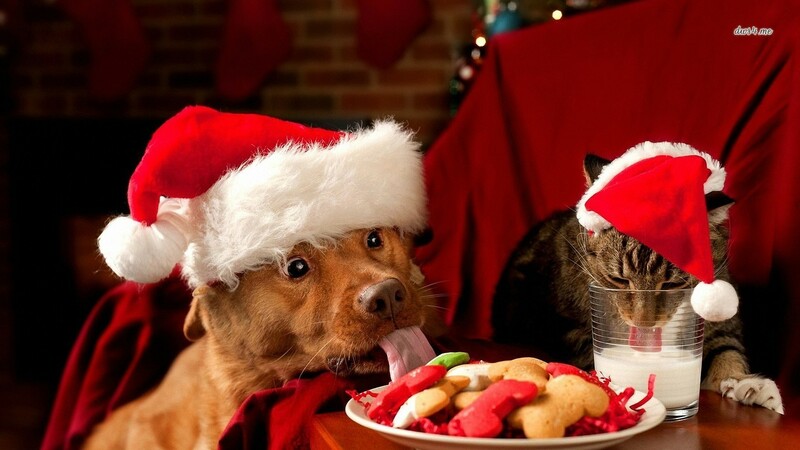 The holidays are a time of temptation: tasty human treats on the counter, visitors to kiss and greet, and presents to open…no wonder it’s hard to be a good dog. Whether your dog loves to be the center of attention or lives an introvert lifestyle, we’ve got several ways to keep your dog and your visitors happy this holiday season. The first and most important: keep current ID on your dog at all times. Escape is common during the holidays with people coming and going. If your dog does get out, or you find a lost pet, check out our local shelter’s recommendation on reuniting pets. 1. When in doubt, crate it out. You crate trained your dog for a reason! Don’t feel bad using it now. The crate is a great solution for dogs who are shy of people, or those who are overly enthusiastic greeters. Having your dog crated in a quiet room away from the hubbub can help them stay calm and relaxed through the holiday chaos. Give your dog a frozen Kong, tasty chew, or puzzle toy to keep them engaged, and play some soft music (we love Through a Dog’s Ear!) to cover the sound of visitors. 2. Trust your dog – and read their body language. Click here for a 10 minute video on the subtleties of dog body language! 3. Treats at the door for four on the floor. In the midst of decorating, cooking and cleaning, how on earth are you going to find time to train your dog to sit rather than jump when guests enter? Don’t worry – we’ve got a way to get you through the holidays. Keep some tasty treats by the door. When it’s time for guests to arrive, put your dog on leash, and whenever someone comes through the door, toss treats at your dog’s feet. This will keep their head down searching for cookies while you greet guests. The leash will ensure that you can walk away with your dog if he starts to jump, and keeps him from sneaking out the door. Drop 2 to 3 very small treats or kibble on your dog’s bed. Once your dog is standing on their bed, continue to drop treats slowly one at a time onto the bed. Pause briefly and count to 5 to see if they will offer a sit or down (continue to look at the bed and not your dog). When they sit, place a treat under their nose and slowly move your hand straight down to the bed and towards you slightly to lure your dog into a ‘down’ position (be sure to let them eat the treat). If they lay down, reward every 1-5 seconds between their front elbow and back legs near their belly (this will cause their hips to relax to the side).